Includes access to the complete, enhanced eBook - unlockinga huge, carefully-selected collection of BONUS CLINICAL material, integrated throughout on almost every page to enhance your study and help make those essential clinical / anatomical connections. 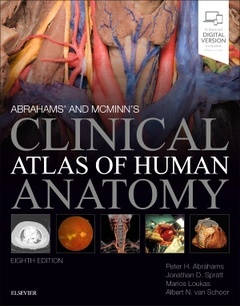 This sets Abrahams' and McMinn'sapart from any other atlases of human anatomy! Chair and Professor in the Department of Anatomical Sciences at St. George's University who has written extensively in the field of anatomy and on the peripheral nerves.